Expert staging services! Heidi is committed to the emerging demand for client assistance with the process of "Readying Your Home For Sale," a "must do" in helping to produce results for sellers by gaining a critical sales edge in a very crowded market. Expert staging services! Heidi is committed to the emerging demand for client assistance with the process of "Readying Your Home For Sale," a recently-recognized industry "must do" in helping to produce results for sellers by gaining a critical sales edge in a very crowded market. 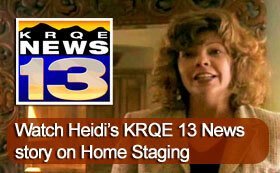 Stay tuned for updates to this page with more details on Heidi's Home Staging Services. "Sell Now, Sell For More" is a live presentation on expert staging. Heidi will be presenting this at the upcoming show this weekend, The Abq Home Lifestyle Expo, February 20th & 21st. Kicking off the show at 10:30AM on Saturday Heidi will introduce the Realtor's role in staging, feature an actual staging demonstration, provide the top 10 tips on staging and provide resources for attendees. Learn how to sell, sell now & sell for more by staging! We've bought and sold a number of properties but haven't worked with many realtors. When we find one we like we stick with them. Hiedi's worked tirelessly for us and saved us lots of headaches. We'll be sticking with her for quite awhile.